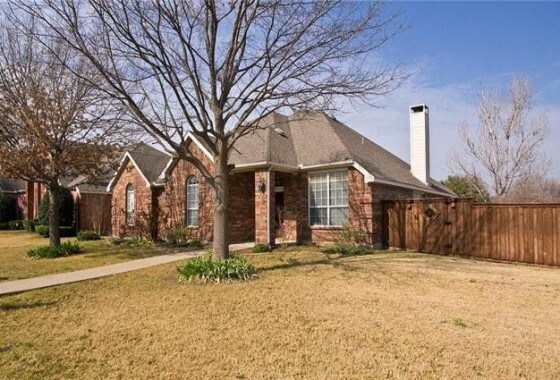 Are you thinking of buying a new Dallas Texas home? If you are and you have a home to sell, you might worry about how to coordinate that. Bridge Loans can help. Are you scared that you might sell your home and not be able to find your next home? Buying and selling simultaneously can be stressful. Wouldn’t you rather buy a new home and then take your time moving? The problem is that you need the equity in your existing home for the down payment on the new home. 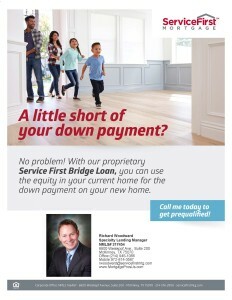 Hi my name is Richard Woodward, Specialty Lending Manager for Service First Mortgage. I’ve been providing home buyers with the best possible mortgage programs for over 17 years. I may have the answer to your buying and selling dilemma. 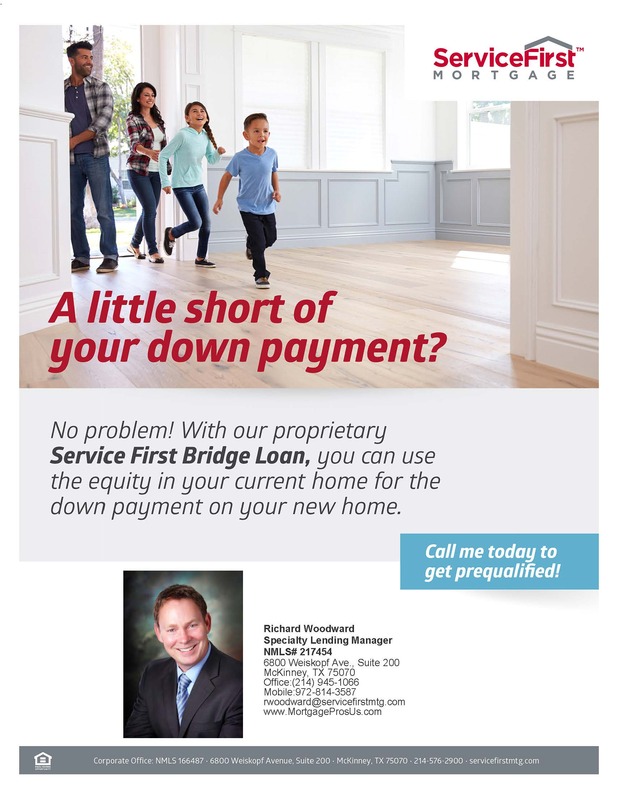 Ultimately my goal is to provide you the best possible home loan and with our exclusive Service First Bridge Loan, we help solve that problem. Our bridge loan program allows you to take out the equity you will need from your existing home to use for the down payment and closing cost of your new home. Close on your new home and then take your time to sell your existing home. The benefits to you are you can better control your move schedule, plan for your new mortgage payment, possibly avoid mortgage insurance. Perhaps most importantly, in this tight sellers’ market, this bridge loan makes your offer more attractive to buyers by not making your offer contingent on the sale of your existing home. By not making your offer contingent upon the sale of your existing home, you are more likely to negotiate the best price on your new home and beat out your competition. My team and I are here for you and we want to make your next home purchase as easy as possible. How to use a Bridge Home Loan to purchase your next home without selling your existing home.